Strong micro USB cable for Android smartphones from Samsung, LG (6ft long) for $7.99 + FREE shipping !!!! reg price $40 !!! 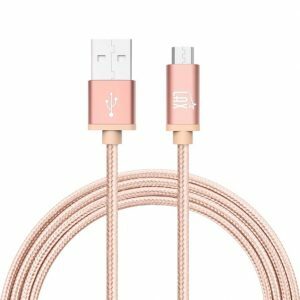 Scoop up this , Strong micro USB cable for Android smartphones from Samsung, LG (6ft long) for $7.99 + FREE shipping !!!! reg price $40 !!! Multiple colors available !! Convenient Length: The length of the cable is 6 feet (1.8M), so it’s long enough to be convenient to charge your device in bedroom, sofa, office, even when you are on the backseat of the car. Perfect replacements for your OEM or original USB cables with superior performance. Quilted Pet Protector Furniture Slip Cover is as low as $13.49 + FREE Shipping!! reg price $80!! 2-Pack Apple Original EarPods with Remote and Mic , for only $18.99 + FREE Shipping!! reg price $30!! OXO Good Grips 3-in-1 Avocado Slicer, Green for $6.99 !!! reg price $10 !! KitchenAid KSM1APC Spiralizer Attachment with Peel, Core and slice for $55.99 + FREE shipping !!!! reg price $130 !! !